In Tibetan, Trandruk refers to a roc and a dragon. As the legend goes, the site where the Trandruk Monastery lies once was a big lake and an evil dragon with five heads lived in the lake. The evil dragon often made trouble for people living around the lake. In order to defeat the dragon and bring the locals back to normal life, Songtsen Gampo turned into a roc and fought with the dragon. Eventually, the dragon was killed. Hence, the Trandruk Monastery was built to commemorate Songtsen Gampo's great deeds. 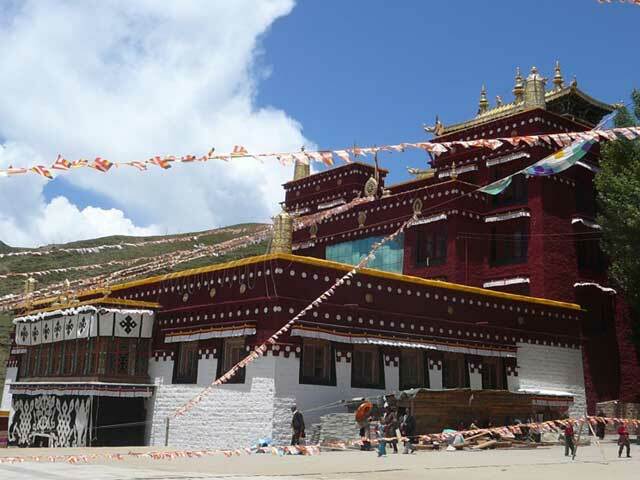 Constructed as the first Buddhist chapel in Tibet, the Trandruk Monastery is situated at the southern slope of the Mt. Gangpo Ri about two kilometers (one mile) from the Tsedang Town. Initially, it was built during the reign of Emperor Songtsen Gampo (617-650), who founded the Tibet Regime in ancient China. Later on, it belonged to the Yellow Hat Sect and had been reconstructed in the early 18th century. So far, it has a history of about 1,300 years. Legend has it that Padmasambhava and other Buddhist hierarchs once practiced Buddhism near the Trandruk Monastery, which made the monastery renowned. Many pilgrims are attracted to come here to worship.